MGT offers a variety of techniques to explore higher dimensions of consciousness. 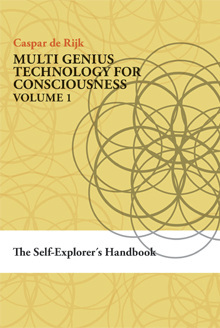 The multi genius approach acknowledges the many sources of wisdom upon which our technology is based. In MGT we mastered the art of dia gnosis, we look through the apparent trouble. That's applying true consciousness and then the right remedies=solutions. “..if our aim is to make life for each individual as abundant and as optimum as possible, then we all will profit from that. Give each individual maximal freedom but then let’s cooperate and not fight against each other. Because we need people that are different. The more different people are the greater is the synergy when they cooperate." Consciousness exploration is pushing the boundaries, the only way to make life as abundant and optimum as possible for everyone. Becoming aware of limiting thoughts and concepts is the first step towards handling unnecessary stops and barriers. Our current predicament on planet earth is merely reflecting our collective thought agreements. Education plays a key role. One has to be willing to investigate, find out what is going on and look through the controlled world view that mass media provide us with. MGT provides intuitive and intellectual exploration routes. The intuitive routes consists of the exploration of inner space and the higher dimensions of consciousness and what holds the world together. We are not looking for trouble, but if we find it, we diagnose it correctly and apply the right remedies. The ‘technology for consciousness’ and the science it is based on, constitute a primary tool for problem-solving, be it in the personal domain or in business. It is the product of a multiple viewpoint system, which is examining knowledge from all possible angles, viewpoints or belief systems. We found that, if one does that and also takes care to compare, we can then find very useful solutions. The modern idea of technology brings up images and thoughts of physical things – everything from iPhones to notebook computers and satellites. But these things just exist at the surface of our material world. The surface view shows us the results – what has already been created – not its source. The technology for consciousness takes us to the source. Technology is defined in this context as the methods of application of an art or science. With this technology put into action, in particular the universal imagination technique, we can take our awareness, ability and intuition to new levels of conscious, creative and innovative action.